Beirut - Among the demonstrators today to mark Land Day, included rabbis from the anti-Zionist ultra-Orthodox group Neturei Karta. 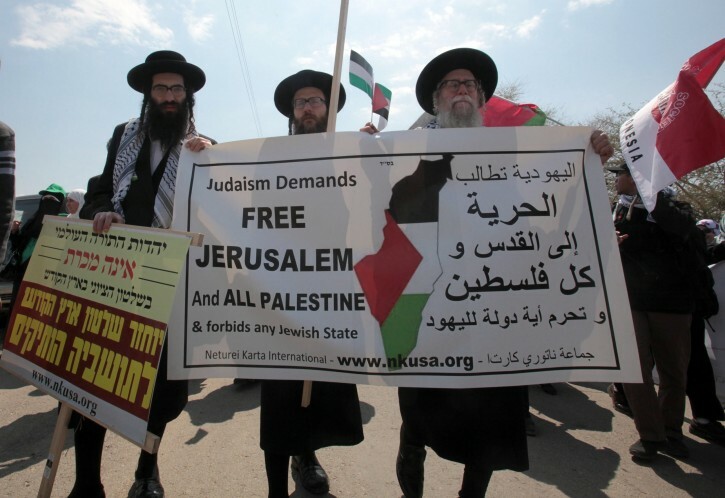 “We are here to mark Land Day, and tell the world not to blame Jewish people for the crimes of Zionism,” Rabbi Ahron Cohen told AFP. The same group visited Thursday the tomb of terrorist Imed Mughniyeh’s in southern Beirut. Mughniyeh, who was on the FBI’s most wanted list since the 1980s, was killed in a car bomb in Damascus on February 12, 2008. He was also accused by Israel of masterminding the 2006 July War. if they feel such solidarity w the arabs, why don't they just move in w them? they will fit right in w the animals & they will have their own minyan!! yimoch shmom-no doubt about that-they are not jews check it out it cant be- hey statmara chasiddim what do u think about these guys? When will we as Klal Yisrael once and for all put these Rotzchim in Cherem! They are Chotim and Machtei es Harabim in the worst way. menuvalim. sonai yisroel. they should stay there for pesach and celebrate their freedom from slaving under the tzionists. This has left me speechless! When I open my door next Friday night and welcome Eiliyohu Hanovi, I'll have Kavonoh for the NK Roidfim, in particular, when I say Sh'foich Chamoshco. Zol Zein Arein Chapen a Misoh M'shunoh vi Di M'raglim. They should not be allowed to return to Israel or the States. Live with the terrorists. Protesting Zionism and the existence of the State is one thing. To lend credence to those who indiscriminately murder Jews has to be a perversion of Torah. These guys have a very prominent space right up front on the stage in GEHENOM. going to the tomb of terrorist imad mughniyeh !! disgusting !! did they put a kvittel that their children should be like him ??!! thats precisely how i felt. as a noahide, i just cant believe this. rav kook was a zionist. “ When I open my door next Friday night and welcome Eiliyohu Hanovi, I'll have Kavonoh for the NK Roidfim, in particular, when I say Sh'foich Chamoshco. Sorry to tell you but the words following Sh'foich Chamoshco is "al hagoiyim" and the are not from them. Maybe we should mispallel that they should have progress in doing the right things. very true avi. one does not bed with the enemies. and imagine whose grave they attended. so the j children who died or were maimed does not mean anything to them. just unadultrated hatred for their own. i feel really ill.
forget about these clowns we need to find their backer. we need to find their backer and expose him or them. They deserve to rot in hell with the murderers. NK sickos have blood on theirs hands just like the Hamas/Hezbolla do as they are inciting more fighting with their ridiculous actions. “ forget about these clowns we need to find their backer. Do they know what is waiting for then after they depart this physical world? These NK goyish jihadists are NOT warring against Zionism. They are KOFRIM joining with Islamic terrorists to make war on Hashem's Torah, especially the first Rashi in the Torah! On this website "frume Yidden" railed against the tzionym. Except the Mufti of Jerusalem Haj Amin el Husseini was decorated by Hitler close friend of Eichmann and organized a Bosnian SS division. In Birkenau the Nazis gassed the left wingers , right wingers and stam Yidden and in Buchenwald the Totenkopf SS did not check if your wear and a right or left wing Jew. Right on N.K. I'm familiar with the words. I had in mind the words right after the ones you quoted ... Asher Loi Y'do'ucho. When did you become the new shoteh on this web site ? This is one case where I think the messenger needs to be tossed aside along with his message. What drugs are you on????? How on earth can you say there was no antisemitism and everybody left the jews alone" i gues you have never read the history of jews. perhaps you yourself are not Jewish. A couple FYI's: People making statements like you are no differnet then Neturei Karta. I was raised Satmar but do not support these guys. NK is not a Satmar organisation - even though the majority of them are Satmarer. Your overgeneralising sounds like a goy and Yidden are better than that. You are both idiots! Tell that to our parents and grandparents that were slaughtered in Europe. Tell that to our great-grandparents that lived through the pogroms, crusades, etc etc etc... what is wrong with you? I am speechles at seeing these pictures. These people are NOT YIDDEN. They do not display Simonei Yisroel. We are supposed to "baishonim, rachmonim & goimlei chasodim" these people go with azus to our enemies who wish to kill us. They are ROIDFIM endangering the lives of countless good yidden. They are MECHALEL SHEM SHOMAYIM B'FARHESYA. Yidden see this sort of thing and it puts them off from becoming more religious. I don't agree with everything that the Neturai Karta does (i.e. literally hugging and kissing Achmadinejad). However, its organization does have some legitimate grievances. The Israeli government, going back to the times of Ben Gurion, never liked the ultra Orthodox, and even today, there is constant tension with ultra Orhtodox and secular Israelis; there appears to be an undeclared war, between the two groups. It was only thirty one years ago, in March, 1981, that the Israeli government sent the Israeli police to the Toldos Aharon Synagogue on Shabbos (Friday evening). The Israeli police broke down the doors, beat men and children without mercy, with their clubs (causing broken bones and other serious injuries), tore up holy books, and scrolls, and threw them out the window. Their raid was very similar to Kristallnacht in 1938. However, even though the above story appeared in The Jewish Press, the entire world was silent. If a similar raid had occurred in Germany, or in a Moslem country, there would have been massive protests. However, just because it occurred in Eretz Yisrael, and it was conducted against "those people", nothing was done about it! A Shanda!! Simple, they encourage others to follow their demonic and perverted view. They put millions of Jewish lives in Sakana... how is that for starters? I am satmar and believe that zionism is against the Torah. We are waiting for Hashem to take us out of golus and then we will be zocha to the Holy Land. ( I won't go into details, everyone is encouraged to learn the Holy sefer V'yoel Moshe, where this topic is discussed and explained) However this is not our way, to go hugging the arabs. Satmar does NOT encourage this behavior! Your comments are exactly the problem... while you say "you don't agree with everything Neturai Karta does" you then go on and make excuses for them. The fact that people have grievances is not an excuse... I'm sure the Nazi's had grievances... so what? There are ways to try to deal with things we don;t agree with and work to fix. This is NOT the way and all of K'lal Yisrael should completely distance ourselves from them! Don't make excuses for Sonai Yisrael... period. Perhaps let us know why the police were sent into the shul on a Friday night. Where they looking for someone ? Did perhaps someone in the building do something that required the police ? From reading your comment it would seem that the poilice got bored down at the station house and decided to just tear up a shul. You have got to have more to say to back up your post. Aside from that can you please just for once remember that the goverenment in power today is NOT the same that was in power 30 years ago. And dont ever compare anything that happens in Israel with "churban Europe" it makes you sound stupid, and litgitamizes the Nazi's. Just like in every class there is some kid who doesn't care how many students' education he interferes with, and how many teachers he hurts, so too is there this immature group of attention seekers who are willing to sacrifice my freedom and yours, just to show off and get some attention, because they think are so much more religious than others. What self hatred and self abuse and self destruction! 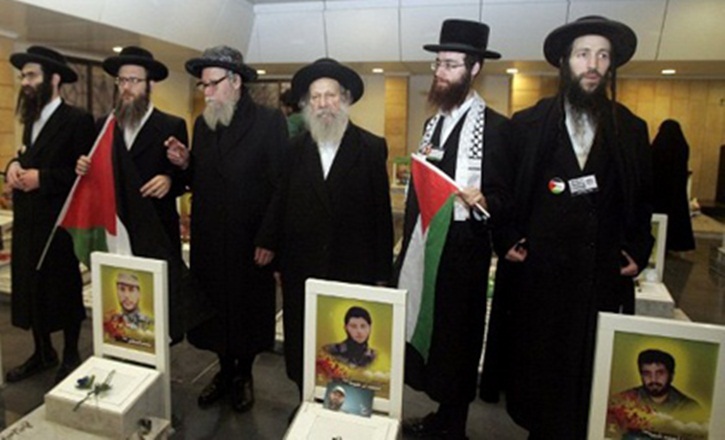 Does Neturei Karta pay VIN for yearly advertising of their events? I understand that Reuters and BBC love yearly circus shows from N.K. but why are they shown here all the time when people already know their desperate attention seeking tactics by now? Neturei Karta is just like PETA: boring, uncreative, stale in ideas, retarding, and not even entertaining as they were in the past. “ What drugs are you on????? Morris, breath deeply. Sarcasm. #7...What a shame they didn't reach the murderer in neither France nor India. Their death might have served the Jewish people well. Their lives certainly don't. Their message seems to be we never found a denier of the holocaust we didn't love. Also, we never found a murderer of Jews we didn't love. Additionally why do they love people who say there never was a temple in Jerusalem? It is beyond rational belief. Zionism is not the problem. The fact is that Hashem let there be zionism and let it go to its coasting way of living in this past 2 centuries. In effect, the nature is that our children have returned to our Homeland and of course, the idea of zionism today is really a non-acheiver. To be better prepared for the future, we must adopt a way of "Jewish Existentialism" where by we of course fight for our existence. This involves in the Land of Israel and abroad. Zionism was a charm to get our people motivated to do what they did. The idea of Existentialism is our Light. I think he was being sarcastic. Lighten up! Your (Presumed) naivete (I'll judge you benignly on this דן לכף זכות .) reminds me of a story that I read somewhere (I know exactly where, but I'd rather not cite the source. אין א "אפיקורסיש'ע" מעשה ביכל) about a confused, but respectable Jewish person before World War II, who was writing a book, refuting all the lies that the nazis (yms"h) said about the Jews. His plan was to send the book to hitler, (ymsh"v) thereby saving the Jews from annihilation. It is. There is not even one Torah authority who supports their (presumed) cause, or advises them on Halachic matters. Their eminent spokesperson , "Rabbi" Weiss was a regular student at a high school in Kansas, in his teenage years. Not that there is anything wrong with that per se. But it shows what sort of background they had in Jewish History and Torah values, altogether. Morris - he was being "tongue in cheek", like saying "that withdrawal from Gaza really improved things a lot, right?" Cool it, Mr. or Ms. Morris. Are you so "flat", Platchig, Square, etc. as not to realize that this post (by shreadready) was done Rhetorically?! (I hope you know what that means)! It was entirely unprovoked, Haaa??!! These guys suffer from OCD lo aleinu. We are prohibited to redeem ourselves from Golus before the time n wtvr but THIS IS NOT WHAT THE SATMAR REBBE MEANT AT ALL. These guys need meds asap. Moshiach NOW. G-d, reveal yourself to us already! Your people are going crazy from this terrible Golus. These hypocrites should be spending Shabbos and Pesach in Gaza!! Then have their citizenship revoked and throw them out of the country!! Why do these people engender such an extreme response? There are many people that do the wrong thing sometimes. Some of them have crooked beliefs. They have not actually harmed anyone, they have just expressed unpopular, possibly erroneous beliefs. Let us all calm down and have a glass of hot tea. I won't be surprised if that infamous Arab Y David Weiss gets $upport directly from Iran! It is one thing having an opinion, but why is he sharing.. and moreover 'embracing' the enemy! no I'm not from satmar! Maybe everyone will understand now why there were KApos, why there were Jewish mosrim and why some Jewish survivors married shikses, and German on top. This scene is Kafkesque and only deviant minds can give credit to a terrorist who indiscriminality killed Jewish children, women and men and murdered Americans. “ Zionism is not the problem. The fact is that Hashem let there be zionism and let it go to its coasting way of living in this past 2 centuries. In effect, the nature is that our children have returned to our Homeland and of course, the idea of zionism today is really a non-acheiver. These individuals CLEARLY are NOT JEWISH.....they appear to have so many psychiatric issues that predate what they are doing.....I am sure that at some point, they were indoctrinated and they must do the same to thier own children...dont; you think that this is child abuse ?If they do not want to live in Israel---let them roam free to whatever country will take them in.....they fail remember that Jews do not behave in this manner.....shame...shame...mega shame....! I would also like to know who is funding these creatures ?Who is investigating them ?someone should...they do not represent, Jews who love the state of Israel..who have fought and spilled their blood so that Jews could live in a free and democratic land....I suppose that they do not understand the Holocaust.....? thoughts ? I'm a satmar chusid & my rather is, my father learned in satmar yeshive before Reb Yoel had the stroke,there were maybe 75 buchrim in the yeshiva, so my father remembers Reb Yoel in his healthy years and in his prime, I once asked my father regarding this group of netirai karta,so my father answerd that satmar rebbi was aginst them,my father remembers the rebbi saying that they come from the kelipa. My father told me, that he remembers Purim day before the Megillah, satmar rebbi told Reb yossel eshkenazi his beloved gabi (right man hand) to go on the bimmah and say that anybody that will participate with the burning of the isreali flag on lee ave in Willamsburg on Purim day( which they still do)he dosn't want to have a part with not beolem hasay and not beolem habah. My father also told me, that remembers a mayor candidate came to compaign in Willamsburg and told satmar rebbi that if elected he'll be aginst Israel, so satmar rebbi answerd I'm aginst Israel because I've a torah but a goy that is it aginst Israel is an anti-Semite that was satmar rebbi shitah, not what people say today,he was aginst Zionism but in the same Time if they needed his help he was there for them. There is no question that they are evil and they represent evil. To me personally, (My opinion of their group) the turning point was when they attended the Holocaust denial conference, sponsored by Ahmadinejad, yms"h. Prior to their attendance of that confab they were looked at as a bunch of misguided clowns. But their attendance changed everything fundamentally. Any Jew who can agree with the old and new nazis even one Percent is evil. If you were literate, (Hope you know what that means) you would know right away which book. It's in one of Chaim Grade's books חיים גראדע , where he portrays a collection of characters that lived in Vilna (Vilnius) shortly before the outbreak of World War II. Btw. His stories are so "Geshmak" to read and the images so vivid that you sometimes think you are living at that time and are part of the story. I've got news for you. Even today, you have some intellectually dishonest individuals (Who claim they're not from NK) who rhapsodize about those "Happy" days before Zionism, when they lived harmoniously and happily alongside the arabs, quoting a certain "Rabbi Kaplan/shmaplan", who was a yeshiva bochur in Chevron. Yep, I have seen those, and while there were most likely "some" friendly Arab neighbors in Hebron, so were there friendly German neighbors pre-WWII. It all boils down to when the right time comes. *hint* Is that the one that was made into a film? While, I haven't actually read any of his books in entire, but I heard and read some here and there (some were translated into English as well).
" His stories are so "Geshmak" to read and the images so vivid that you sometimes think you are living at that time and are part of the story." Because the NK is doing something wrong does not mean the Isreali goverment is right, Guys don't forget the isreali goverment is the biggest shame for us!!! V'shaim reshaim yirkav!!!!! May they die a misa meshuna! You could not see a joke if it hit you squarely between the eyes. It is no secret, here on VIN, that I am Jewish, Israeli and a Zionist - in that order. My yiddishkeit is paramount in my life. It is no secret either, here on VIN, that I will vigorously defend the other two tenets of my existence: my nationality and my political outlook. & let's be clear on this one, thay hate you when thay see u wear payes/ yamika/"
I do not know whether to laugh at his idiocy or to cry over his crazy and misbegotten 'hashkafa'. I have payot and a yarmulka. I wore both during 22 years service in the IDF, I wear them now while practising my profession and עי"ה I shall wear them until I die. And no, I don't need to be "from Satmar" to do that. Just a יהודי פשוט, ירא שמיים with respect for others. “ It is no secret, here on VIN, that I am Jewish, Israeli and a Zionist - in that order. My yiddishkeit is paramount in my life. “ These guys suffer from OCD lo aleinu. We are prohibited to redeem ourselves from Golus before the time n wtvr but THIS IS NOT WHAT THE SATMAR REBBE MEANT AT ALL. These guys need meds asap.